Anyway, I’ve watched Crocs evolve over the years and slowly, ever so freakin slowly, they’ve morphed from le clog I associate with ER shift workers, chefs and people who can’t get laid into something that I… might… (oooh God, it’s so difficult to say…) actually wear! In fact, let me just come out and say it; I now own a pair of Crocs and I really, REALLY like them! 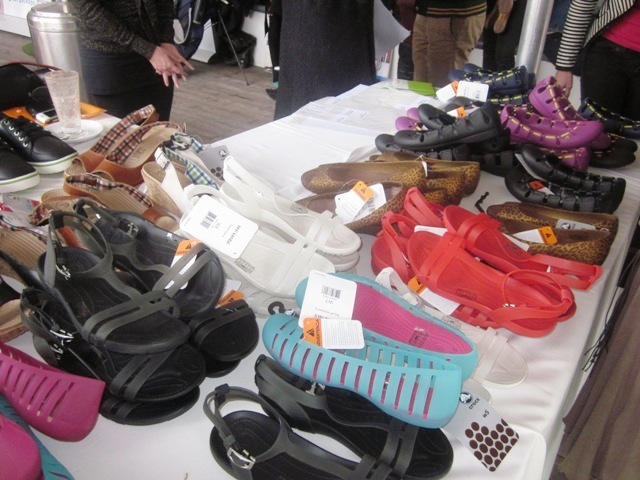 I attended a launch the other day, held at The Grand on the Beach, and got to get up close and personal with a couple of their new styles. From afar these Carlie Flat Animal Waves (R549,95) look a bit too ‘gold’ on my feet the same style in black would be totally awesome. While I still don’t love every Croc I see (some are still a bit too unfeminine or ‘plastiek’ for my liking), there are some that are ridiculously cute. And don’t get me started on the whole comfort thing… Every single Croc-wearer says the same bloody thing; ‘MAN, THEY’RE SOOO FRIKKEN COMFORTABLE…’ God! My eyes used to roll into the back of my head… But here’s the kicker… IT’S TRUE! I love how my li’l blue babies’ grip the ground as I walk. And their rubbery little soles put a bounce in my step. They make me feel like I could go for a run on the prom with them and I’m almost tempted to try it. 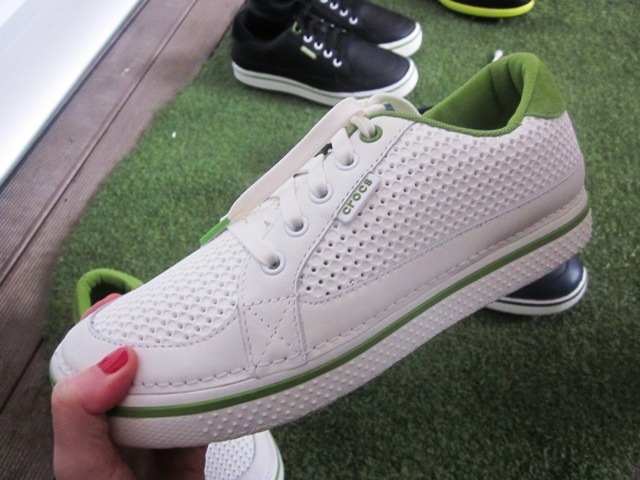 Crocs have also teamed up with Hank Hayden to create a golf range. I had no clue who he was but my golf freak boyfriend says he’s a ‘big deal’ ‘cos he coached Tiger Woods. Anyway, it would seem there’s a limit to my Croc rocking… I picked up a pair of black rubbery thongs wondering if they’d be a good fit for summer and plonked myself onto a deck chair to try them on. Alas, the ‘chair’ was just a deck chair frame with a Crocs branded towel draped on it so I hit the ground HARD! Clearly its God’s way of saying there’s only so much Croc I can handle. Still, I never thought I’d own and appreciate a pair of Crocs but as it turns out, I do. I really, really do. P.S. There was a prize for the most ‘eye-catchingly’ dressed guest. There was no competition when Olivie Keck from House & Leisure rocked up in her eye-catching colourblock sequin jacket. 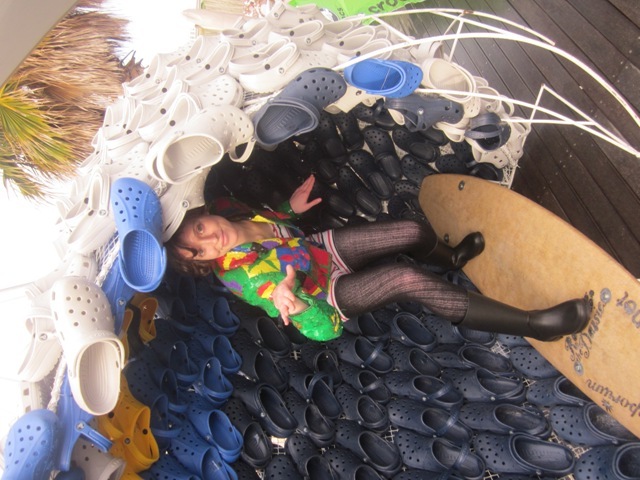 To celebrate, she took a quick ‘surf’ in the Croc wave o’ awesomess. As you do. I am one of those people that when I walk past a Crocs store I have to close my eyes or look the other way…but I have to admit, I quite like the blue little flats. The Adrina Flats II are cute! It was a difficult choice to make for the Spring/Summer Collection. Can’t say the same for the Fall/Holiday Collection though. I attended the launch recently and I was a tad disappointed. The colours are a lot more subdued but I suppose it’s expected since the season is changing but the designs seem to have gone back to the very basic, unexciting. *sigh* But I’m still wearing my Carliana Peep Toe Ombre and loving them!